Hello, I've been having some trouble with Smitfraud-C.CoreService on my company computer. Unfortunately my IT people have been swamped with projects and haven't had the time to help me out, but have cleared me to try to get help here. I've been using Spybot S&D but core.cache.dsk seems to always find its way back, along with other new items. As far as symptoms, the only majorly noticeable one is a pop-up every time I open a new web page in IE. The following is my HJT log, I also have logs from Spybot S&D, AVG, and SuperAnti Spyware. Thank you for any help you can provide and for the service that you provide to the online community. I am Thunderbird1988 and I am going to remove your malwareproblems. If you have questions, feel free to ask. We must disable the Real-Time Protection feature of Windows Defender for it may interfere with the changes we need to make. Go to "Tools" | "General Settings"
Remember to reactivate this feature when we have finished all our work. Thank you again for all your help, and I look forward to hearing from you. Ok, apparently I thought I turned off TeaTimer but I guess I didn't. Pretty sure I have it off now though. Here's a new HJT log. Will I need to run ComboFix again, or does TeaTimer not interfere with it? ***EDIT***: Some good news! I just found out that my IT people finally took some time to install a Spyware/Grayware module into my Trend Micro OfficeScan. Also, I had forgotten to mention that after running ComboFix, Trend Micro OfficeScan did locate and clean two instances of "Freeloader_Smitfraud" during a real-time scan, both appear to have been in folders on my C drive (one in a folder named ComboFix, and one in a folder that appears to have been randomly named), the file was named "dumphive.cfexe". Also, following a manual scan it removed "TSPY_Bifrose" which appears to have been a trojan effecting three of my registry entries with some references to "wget". A new scan with Spybot S&D shows that my system is clean. IE seems to respond much faster now and I have not encountered a single pop-up. Should I assume that my system is now clean, or are there more steps that you suggest to take? Oh, also one more thing, I have noticed that my Windows clock and date display has changed format, it now shows time in a 24:00 format and the date year first. 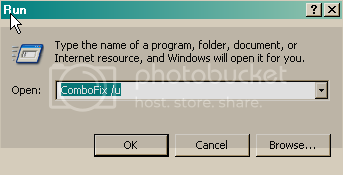 Was this editted by ComboFix, and how can I restore it? Thanks again Thunderbird1988! Edited by bouncer72382, 06 February 2008 - 04:27 PM. It seems that Teatimer didn't interfered with Combofix. Your Combofixlog revealed some other malwarefolders, I don't know if they all got cleaned up by your scanners, but I think best way to proceed is removing them. Yes, the times have been reset by Combofix, we will set it back when the computer is cleaned. Edited by Thunderbird1988, 07 February 2008 - 03:25 AM. Thanks again for your help, have a great weekend! The detection of Dumphive.cfexe is a False positive (A file/folder that is detected as a virus but actually is not) and is therefore nothing to worry about. It's a part of Combofix. After that please let me know if you experience any problems. Hello, I just ran "ComboFix /u" and received a message that ComboFix was unistalled; however, I did not see a disclaimer and there was no option "2". I think some files from ComboFix's process are still around such as the "catchme" files and the log. Also, the clock settings do not appear to be restored. Ah.. but now I realize I did turn Defender's real-time protection back on after the last run of ComboFix and didn't turn it off for this.. >.< Would that have interfered with the uninstall? It is possible that the realtime protection has interfered. We will set the clock back manually. You can fix your clock from Control Panel ->Regional and Language Options and then on the Regional Options tab click the Customize button then on the next form click the Time tab. Then change the Time format to what you want. It explains there what the lower case and upper case letters will do. Upper case H is giving you 24 hour clock settings. Please delete Combofix.exe and C:\Qoobox if they are still available. You can also delete Catchme. After you have deleted this. Please enable your real time protection again. After that please tell me if you still experience any problems. Hey Thunderbird1988, I got my clock and date set back to normal and deleted the files that I know were associated with ComboFix. The Qoobox folder was already deleted. I haven't run any scans yet this morning, but I also haven't noticed any problems, and I had no problems removing those files. Thanks again for all your help, I greatly appreciate it. I would normally give you prevention tips. However, many if not all those tips are for personal computers, and I don't know too well about business software. I think your IT people know best how to protect the computer from getting infected in the future.